Waterproof and tear proof fishing and boating maps of the lakes in the United States. Including structure, depth, navigation markers, GPS points, old roadbeds and marina locations. Contour lake maps and intracoastal waterway charts, CD-ROM of the maps, custom mapping, cases, books and reference materials. Offers lake maps and fishing maps covering almost four thousand lakes, rivers, and reservoirs in the United States and Canada. Retailer for ZIP code maps and data, business maps, wall maps, globes, and other maps. Product descriptions and photos. Reproductions of land ownership maps of New England, especially the ca. 1860 wall maps. Some maps are on paper, some on CDROM. Most are of areas in New Hampshire, Vermont, and Massachusetts. Retailer of Arizona topo and geologic maps, US trail, road, and recreation maps, and other maps, star charts, and globes. Retail and online sales of Arizona topo and geologic maps, US trail, road, and recreation maps, and other maps, star charts, and globes. Retailer of maps, globes, street atlases, and wall maps. Also NOAA and USGS maps. Florida maps a specialty. Products include descriptions and photos. Publishes laminated, accordion-fold, indexed street maps of cities and regions. Also publishes maps focused on museums and cultural sites, and maps of transit systems. Products and company history. Produces digital fishing maps on CD-ROM, color lake depth charts and three dimensional depth charts. Sells hand-drawn historical maps of the United States, based on USGS maps. Subjects include Original 13 States, U. S. Statehood maps, and maps of various periods and events. Specializes in lake whitefish products, order via email, fax or toll-free telephone. Specializing in business and reference maps or maps created to your specifications, located in Atlanta, Georgia. Retailer of smoked lake trout, ciscos, Alaskan salmon and Lake Superior whitefish. Canadian topographic maps, road maps, atlases, wall maps and nautical charts on paper or CD-ROM. Offers maps, prints, and books about maps and mapmakers. Includes a searchable database of maps and sea charts. Interactive maps including air, railway network, highways, and distance charts, pin code search engine and tourist maps. Sells a large selection of atlases and road maps of the United States: national, state, county, city and regional maps. Maps, books, accessories, software. Full coverage of USGS Arizona Topo maps. Locations in Phoenix and Mesa. Offers digitally cleaned reproductions of antique and historical maps and images, and the creation of contemporary thematic maps suitable for display. Publishes pictorial maps of major visitor destinations, focused on areas in the western United States. Map descriptions, sample images, and online versions of two of the maps. Publishes street atlases, wall maps, custom maps, and zip code maps, with a focus on southeastern United States. Also sells map-related products of other publishers. Product and company information. Maps for business and reference, specializing in custom cartography for regional marketing and sales. In-stock wall maps, globes, and atlases. Mounting, laminating and framing services available. Publishes street and road maps covering the majority of California and Nevada, as well as sections of Washington, Utah, Arizona, and Hawaii. Also sells maps of other publishers. Product descriptions and cover photos. If the business hours of Lake Maps in may vary on holidays like Valentine’s Day, Washington’s Birthday, St. Patrick’s Day, Easter, Easter eve and Mother’s day. We display standard opening hours and price ranges in our profile site. We recommend to check out lake-maps.com for further information. 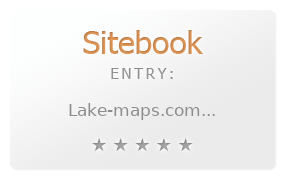 You can also search for Alternatives for lake-maps.com on our Review Site Sitebook.org All trademarks are the property of their respective owners. If we should delete this entry, please send us a short E-Mail.